If the product shows as "Out of Stock" then that specific course date is Sold Out, please select another course date. 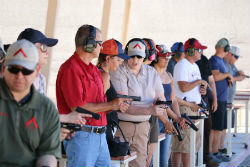 The 5 hours of Range instruction we offer during our Nevada Concealed Firearms Permit Course, or Multi-State Course is available to anyone who might already have their permit, and desire to have better range safety habits, gun handling, and of course improve their marksmanship skills. This time also applies as our Pistol Fundamentals training that we require our students to attend prior to our ongoing Foundry training sessions. Attention current and past Students: Be sure to log into your account to receive the discount for this course, it is only $25 for returning students. Upon logging in, you will see the price automatically drop. Come out and train with us!